Seamus Heaney was a renowned Irish poet, playwright and professor. He was the recipient of several prizes during his lifetime, including the Nobel Prize in Literature. When he died in 2013 he was described in the British newspaper, The Independent as ‘probably the best-known poet in the world’. Seamus Justin Heaney was born in Mossbawn near Toomebridge Co Derry on the shores of Lough Neagh in Northern Ireland on April 13th 1939. He attended Anahorish Primary school and was awarded a scholarship to St Columb’s College in the city of Derry. When Heaney completed his secondary education he went on to study at Queen’s University in Belfast. He graduated with an Honours Degree in English Language and Literature in 1961. Following graduation Seamus Heaney worked for time as a school teacher before becoming a college lecturer at St Joseph’s Teacher Training College in Belfast. In 1966 he was appointed lecturer in Modern English Literature at Queen’s University Belfast. Heaney published his first book ‘Eleven Poems’ in 1965. In 1966 the publication of ‘Death of a Naturalist’ won several awards and received immense acclamation. During his lifetime Seamus Heaney went on to publish several acclaimed books of poetry including ‘North’ (1974), ‘Station Island’ (1984), ‘The Spirit Level’ (1996) and ‘District and Circle’ (2006). 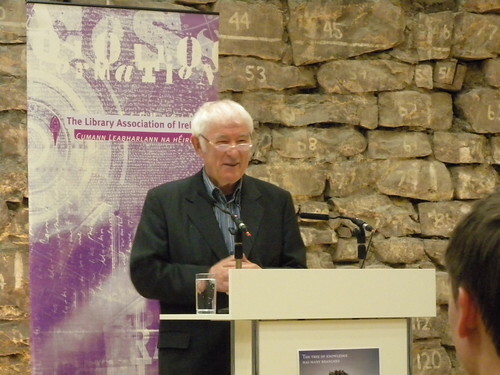 Heaney continued with his career as a university lecturer and in 1970 he was a guest lecturer at the Berkeley campus of the University of California. In 1972 he was appointed lecturer at Carysfort College, Blackrock, Co Dublin. He was appointed first as visiting Professor at Harvard in 1981 and from 1985 until 1997 as Professor of Rhetoric and Oratory. He later became ‘Poet in Residence’. He was also elected as professor of Poetry at Oxford between 1989 and 1994. He lay in the four foot box as in a cot. Seamus Heaney, renowned Irish poet, playwright, professor and winner of the Nobel Prize in Literature died in Dublin at the age of 74 in the year 2013 On This Day.